Samantha Fox to play Wladyslawowo Summer Festival in Poland? According to a recent article published on a Polish site, Samantha Fox could be one of the performers at this year's edition of the Summer Festival at the Ocean Park in Wladyslawowo (Poland). Among the names who could be on the stage you find Sandra, La Bouche, Lou Bega and Culture Beat. As this is only a rumor, no names or dates have been confirmed yet. The newly-designed samfoxitalia.com comes along with brand new lyrics pages to all of Sam Fox songs. You can find and enjoy the words of your favourite tunes starting from this page. Yet another important coverage of the event which will take place this Saturday in Santiago (Chile) comes this time from the local CNN. Click here to visit the page and watch the short video presentation for the Hit Parade. ...and more records are being added. 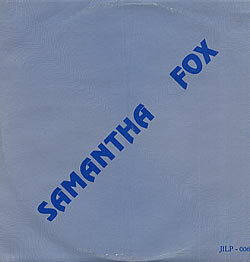 Since 25th December 2009 the Samantha Fox discography website has been collecting all the different types of releases from every Country in the world, counting now more than 1000 items! Limited editions, promotional records, picture discs and unique covers are all up for you to enjoy, also thanks to all the fans who are contributing with pictures from their own collections. 5th April is approaching and Chilean press is having more coverage for the big event that will take place at the Movistar Arena in Santiago. The Hit Parade Festival will feature spectacular performances by Samantha Fox, Debbie Gibson, Rick Astley and Martika. Check these articles published on Partymonster, Romantica, Emol, Radio Concierto, Magic Music Magazine. Samantha Fox & Gayle Tuesday cover of "Don't Look Back In Anger"
Samantha Fox was one of the guest on the first episode of the popular UK TV show "Gayle's World" broadcasted on June 1997. Here's the video for the cover of Oasis "Don't Look Back In Anger" together with the host Gayle Tuesday. The latest tickets to be available for the Celebrate The 80's & 90's tour are the ones for the Spanish stop at the Navarra circuit. This is the official announcement: "All the way from sunny California, David Hasselhoff joins us in Spain to have a super 80´s and 90´s party. David invited many friends amongst others 2 Unlimited, Vengaboys, Rick Astley, Twenty 4 Seven, DJ Sash! and Turbo B from Snap! And of course the lovely Samantha Fox! Pre-party starts at 6 pm". Buy your tix here at 20 Euro each. You have requested some more pictures from the backstage video for Sam's mega hit "Nothing's Gonna Stop Me Now", so they have been collected in a new photo gallery to enjoy. 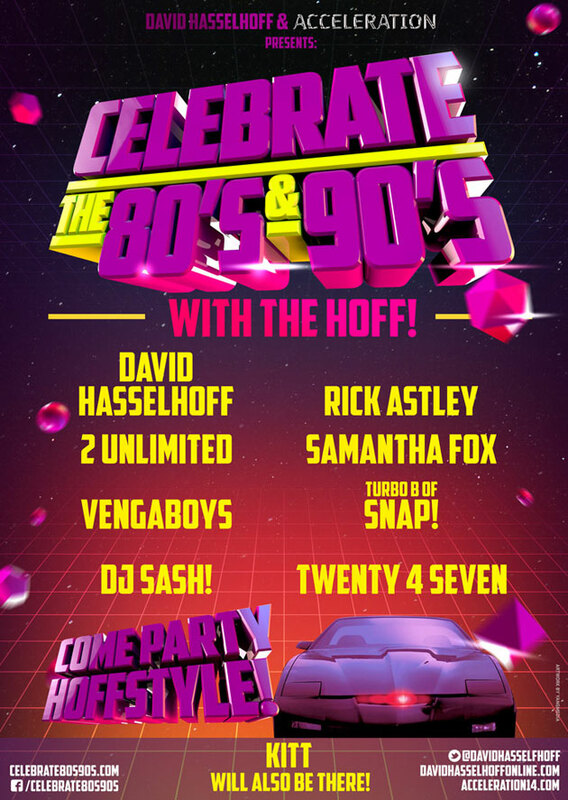 David Hasselhoff, host of the upcoming Celebrate The 80's & 90's European Tour, recently presented the event in Italy. Read the articles and watch the video interviews on these sites: Oggi, Outune, Quotidiano Nazionale. Chile loves Samantha Fox and they are proving it with even more coverage about her partecipation at the forthcoming Hit Parade festival in Santiago. At Terra website, Sam reveas how much she loves Chile, talks about her 10th album in the making (it should be out this Summer), the new movie she stars in and the love of her loyal fans. Find out this and lots more by clicking here. INTERVISTA AL SITO CILENO "TERRA"
Tickets for the Celebrate The 80's & 90's European tour are on sale for the dates in Portugal (25th April) and Germany (23rd May). Other dates will soon be available, in the meantime you can buy tickets for the two events on this page. 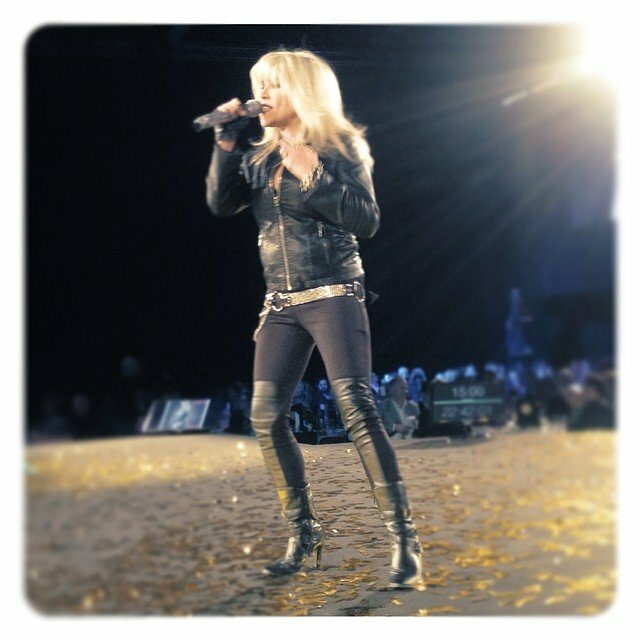 Samantha Fox made a special appearance at the 2014 Guld Nyckeln Awards in Stockholm yesterday. Click here to see pictures collected from the event. Step back in time: on the set of "Nothing's Gonna Stop Me Now"
This rare magazine page features pictures of Samantha Fox shooting her hit video for "Nothing's Gonna Stop Me Now" with director Terry Bulley. 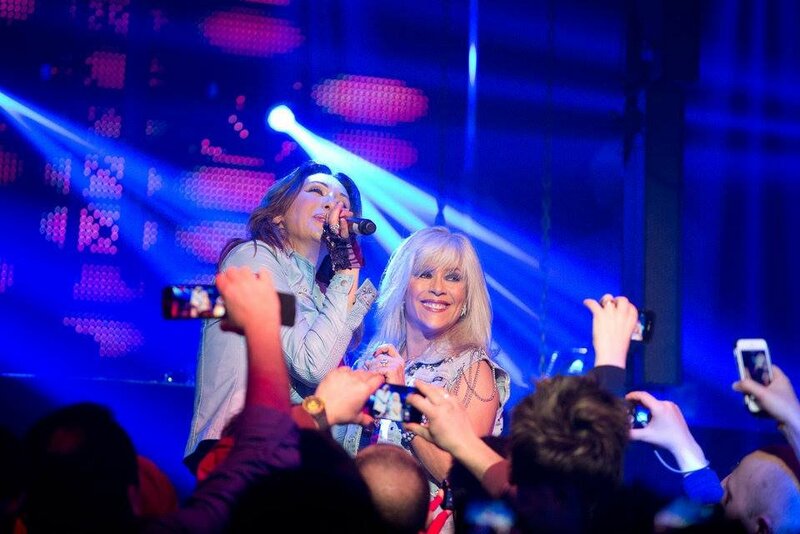 An interview with Samantha Fox and Sabrina backstage at Mad Club in Switzerland has been posted online. Another great interview with Samantha Fox has been published by Chilean magazine HoyxHoy and you can read it by clicking here. Find out how she learned Spanish language, her thoughts on bullying and her forthcoming projects. Chilean newspaper El Mercurio recently interviewed Samantha Fox for her forthcoming performance at the Hit Parade Festival in April. In the article below, Sam wishes to publish her autobiography in 2015 and reveals she is currently working in studio with Per Magnusson on her new album, the Swedish music producer known for producing hits for Boyzone, Britney Spears, Backstreet Boys, Leona Lewis and many others. Talking about the show in Chile, Miss Fox says she will perform her biggest hits and maybe even a couple of new songs! Full Force have just been interviewed by WBLS radio in New York for their 30th anniversary in music, announcing the release of a new album called "With Love From Our Friends", which will be out this Summer. The star-studded new project also features the much anticipated collaboration with Samantha Fox, the first after Sam's 1991 "Just One Night" album. All the details surrounding the Full Force all-star music project are going to be revealed today live in the US at 3:30 p.m. on #1 urban radio WBLS. You can also listen to the event online on www.wbls.com. Samantha Fox herself just posted the following: "Think I'm gonna be 'naughty girls need love too today'". Will she be one of the special guest on the radio program? Just tune in to find out. This is another video message recorded by Samantha Fox for her forthcoming concert in Chile. Samantha Fox invites her fans to the Hit Parade festival which will take place in Chile on 5th April. Watch below her special video message. It's been a hot night at the Mad Club in Lausanne last Friday with superstar Samantha Fox and Sabrina performing together on stage for the first time in Switzerland. A first video of Sam has appeared on YouTube and pictures are being collected in this new photo gallery. Here are the first two pictures from last night show in Lausanne (Switzerland) at Mad Club with Sabrina. Here's a very nice video of Samantha Fox at Finnish TV in 1995 promoting her single "Let Me Be Free". 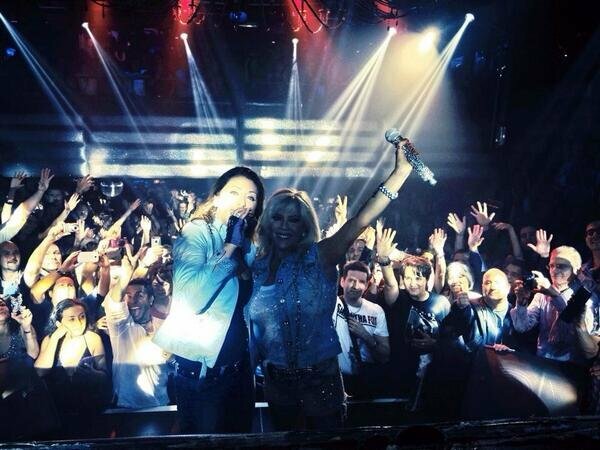 Samantha Fox and Sabrina will make a special appearance this Friday in Lausanne. They will perform together for the first time in Switzerland at the Mad Club. Don't miss this unique chance to catch the two stars performing live their greatest songs and their duet for "Call Me". More info in the Mad Club website. With the release of the official "Seven Cases" trailer, new images showing Samantha Fox have been revealed. Check them out in this movie gallery featuring Sam only. 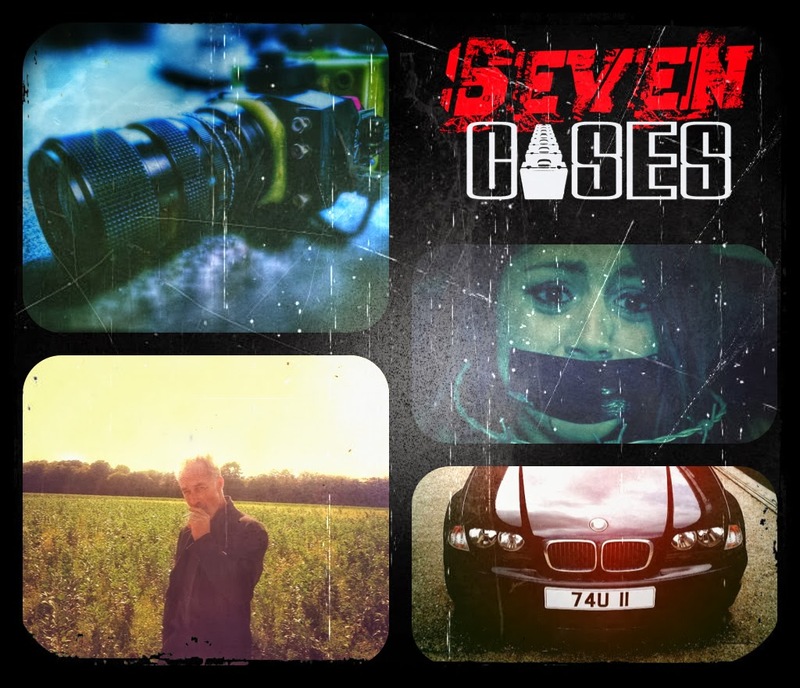 NUOVE IMMAGINI DI SAMANTHA FOX IN "SEVEN CASES"
The official trailer for Sean J. Vincent's latest movie "Seven Cases" has been released few hours ago. Watch below the 3 minutes preview which includes some great Samantha Fox shots! IL TRAILER UFFICIALE DI "SEVEN CASES"
Big news for all foxy fans in Chile: Samantha Fox has been confirmed among other performers such as Rick Astley, Martika and Debbie Gibson for "El Festival De Los 80's Hit Parade" at the Moviestar Arena in Santiago on 5th April. Tickets are available on Puntoticket, so don't miss this special event.